These Chocolate Coconut Brownies may look a little too complicated because of the amount of steps but it’s a very easy recipe to make – I promise! If you’re a fan of coconut desserts this is one recipe you do not want to miss! 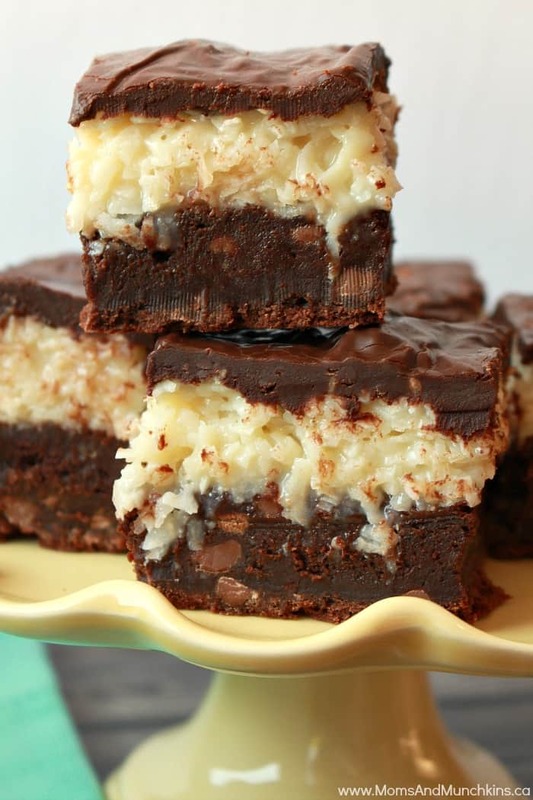 The best brownies on the bottom, chewy coconut middle and a chocolate ganache topping. Go ahead and grab a napkin for that drool…I’ll wait. Whenever I’m making a dessert recipe for the blog, I tell myself “Oh, I’ll just taste a little bit to make sure it’s a delicious recipe to share on the blog”. Then of course the piece I cut wasn’t cut evenly so I have to even it out by cutting off a little bit more. Then it sits in the fridge for a little bit and I have to try another piece because it probably tastes different now that it’s been in the fridge for an hour, right? Then comes the blog photos. I cut up the desserts or bite into some for photos but I can’t give someone else a half eaten brownie, right? Right! So down that one goes into my belly too. Before I know it, my little taste has turned into half a 8″ pan of brownies. Oh well, it’s all for research…right? Yes, there are a quite a few steps here for making these brownies but I promise you that it’s easy and well worth the effort. 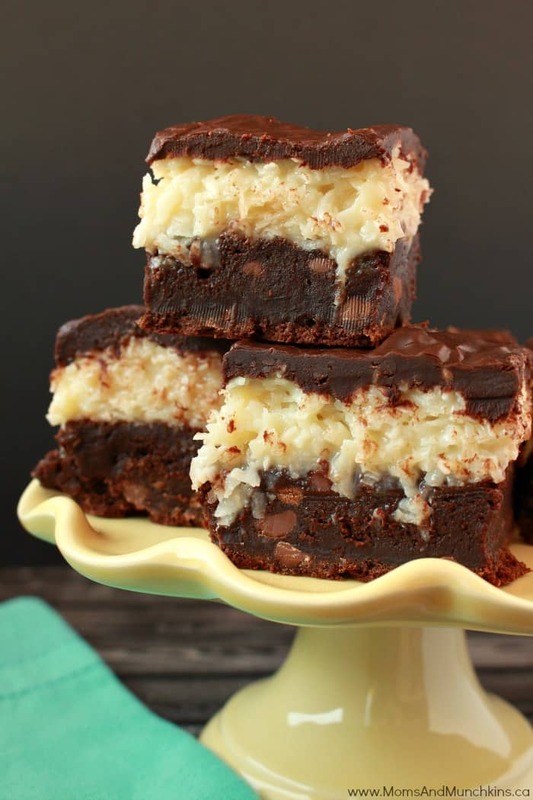 Now let’s get to the recipe so you can be biting into one of these Chocolate Coconut Brownies soon. You'll want to start by making the chocolate ganache because you'll want this to cool and thicken for two hours in the refrigerator before spreading over the brownies. Line an 8" square baking pan with parchment paper. In a small bowl, melt butter with semisweet chocolate chips in the microwave. Check and stir at 30 second intervals because you don't want to overheat this. You want this melted but not hot. In a separate bowl, combine flour, cocoa powder and salt. Set this aside. In a large bowl, whisk sugar with eggs and vanilla until well mixed. Add melted chocolate mixture to egg mixture and stir just until mixed. Add flour mixture to chocolate mixture and stir just until combined. Pour brownie batter into parchment paper lined pan. Combine all ingredients in large bowl and stir well to mix. Spread evenly over baked brownie layer. Place chocolate chips in a medium bowl. Set aside. In a small saucepan, bring heavy cream to a boil over medium-high heat. Once boiling, immediately pour over chocolate chips. Let sit for 5 minutes before stirring. Place ganache in fridge for at least two hours before spreading over brownies. Spread chocolate ganache over the coconut layer as soon as it comes out of the oven. Let Chocolate Coconut Brownies cool in the refrigerator for at least two hours before removing from pan and cutting into squares. Store leftovers in refrigerator. Love chocolate & coconut desserts? I do too so you’ll find plenty of them here on the blog! 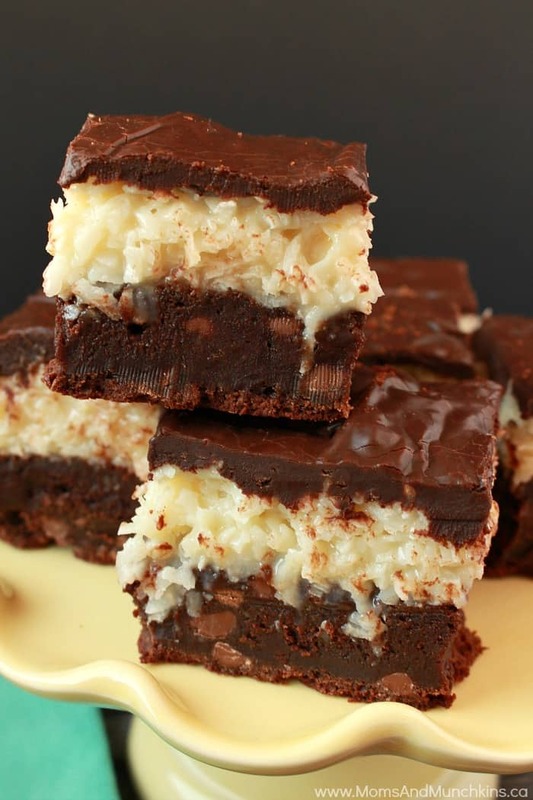 Triple Chocolate Coconut Bars – these could not be any easier to make. 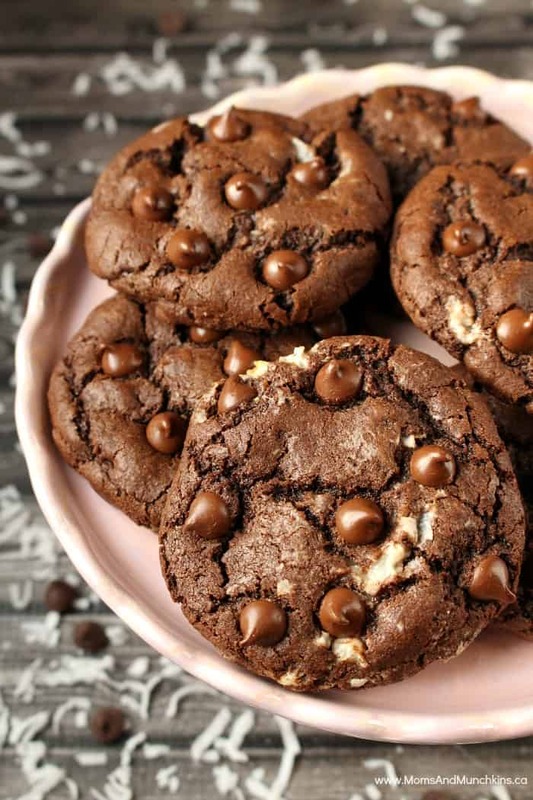 Double Chocolate Coconut Cookies – a soft baked chocolate cookie with a delicious coconut macaroon in the middle. 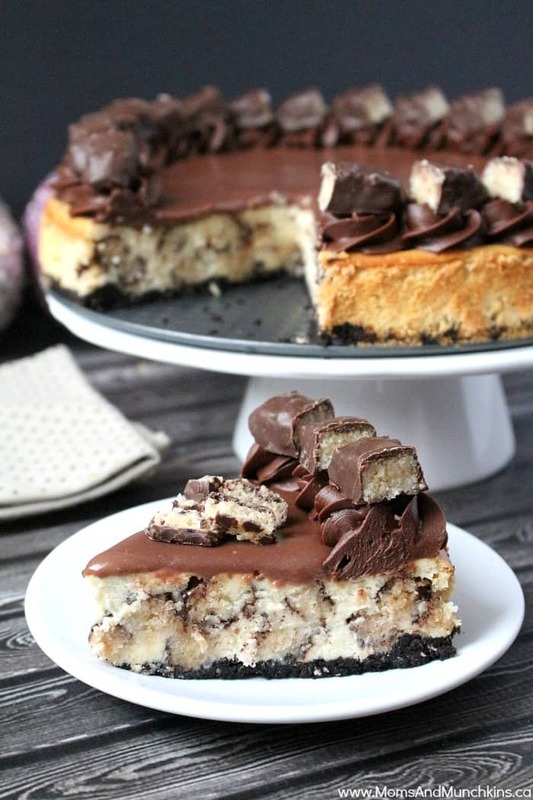 Chocolate Macaroon Cheesecake – my absolute favorite cheesecake recipe! 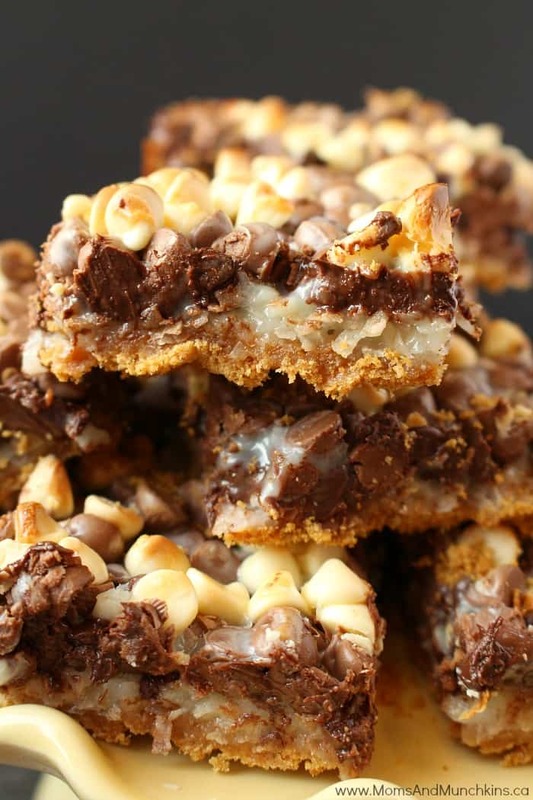 You’ll find more delicious sweet treats on our Desserts page. Never miss an update by following us on Facebook, Instagram, Pinterest and Twitter. You are absolutely killing the dessert game over here. I never leave this page without a hankering for something sweet. 🙂 These look absolutely amazing! Thank you so much, Karly! I certainly ate way more than my fair share of these.